The president and first lady report having assets worth between $2 million and $7 million in 2014. Like millions of other Americans, President and Mrs. Obama are still paying off their mortgage. But unlike a lot of Americans, they also have substantial cash and savings -- both for their daughters' college educations and for their retirement. They're also in line to receive that dinosaur of retirement income: a defined-benefit pension. That's all according to their 2014 financial disclosure, which was released on Friday. Like other top federal officials, the president is required to disclose his personal finances annually. All told, the Obamas' assets fall between $2 million and $7 million. Checking accounts, paltry interest: The First Couple has three checking accounts that combined were worth between $52,000 and $130,000. The interest in all cases was less than $201. Not exactly daring investors: Bonds and index funds. That's where the Obamas' major investments live. The couple hold between $1 million and $5 million in U.S. Treasury Notes. Those investments threw off between $15,000 and $50,000 in interest last year. In addition, they have another $250,000 to 500,000 in U.S. Treasury bills in a SEP-IRA. And they have another $300,000 to $750,000 invested across three different Vanguard index funds. Pension on tap: Obama's time in the Illinois legislature earned him a pension valued between $50,000 and $100,000. College savings: The Obamas have four different 529 savings plans, each worth between $50,000 and $100,000. Outside income: The president's life as an author of several books is still paying off. 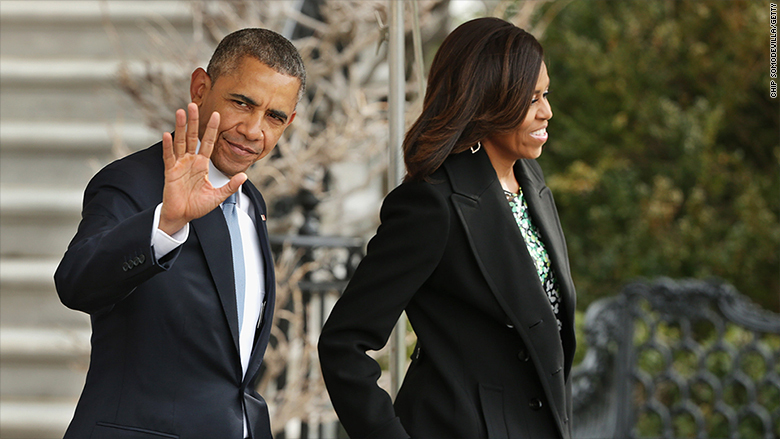 The Obamas reported combined royalty income of between $45,000 and $150,000. Their one liability: Their Chicago home, which they haven't spent much time since 2009, is still costing them. They're still paying off a 30-year mortgage of between $500,000 and $1 million. Their interest rate: 5.625%.